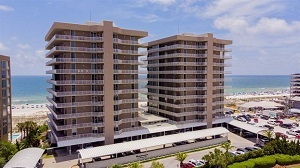 Perdido Key beachfront luxury condo for sale at Mediterranean. This 4BR/4.5BA resort property has 3705+/- sq. ft. and incredible vistas of the Gulf of Mexico, Ole River & Ono Island. With 1500 sq. ft. of balcony great for watching amazing sunsets and for entertaining family & friends. This gulf-front Perdido Key residence has floor-to-ceiling windows throughout, direct access to the private balcony from each room, travertine flooring in all living areas, and has been recently painted in neutral tones. The kitchen is well equipped with double ovens, subzero refrigerator, tons of cabinetry topped with granite and a new dishwasher. The master bath has steam shower, jetted tub, marble topped double vanities and walk in closet. The other 3 spacious, en suite bedrooms have water views and balcony access for watching dolphins, parasails, boats. There is also nice amenities for your enjoyment from both indoor and outdoor pools, fitness room with sauna, community room and even large cages for your outdoor beach chairs and toys. There’s more, come see this condominium!